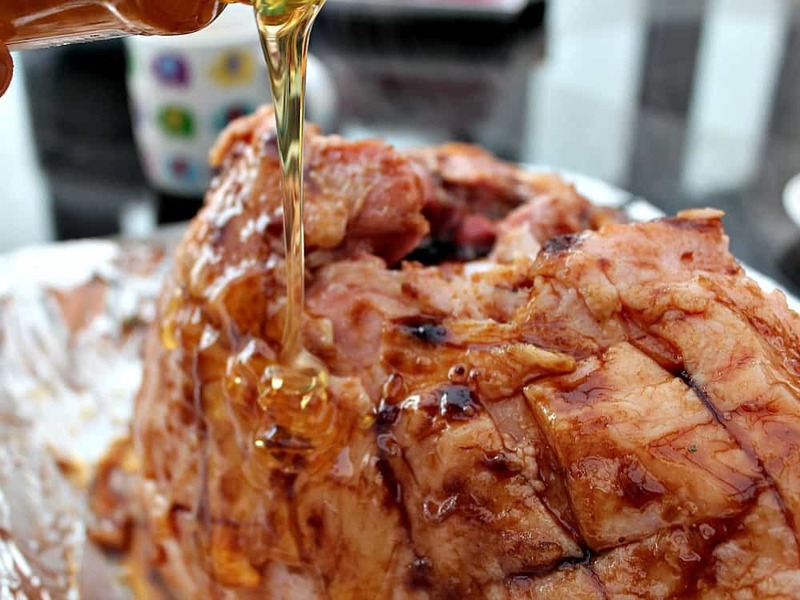 Honey Glazed Ham. Super easy recipe and guaranteed to be packed full of flavour and very moist. Perfect served warm or cold, or both! 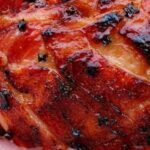 Honey Glazed Ham! So delicious! 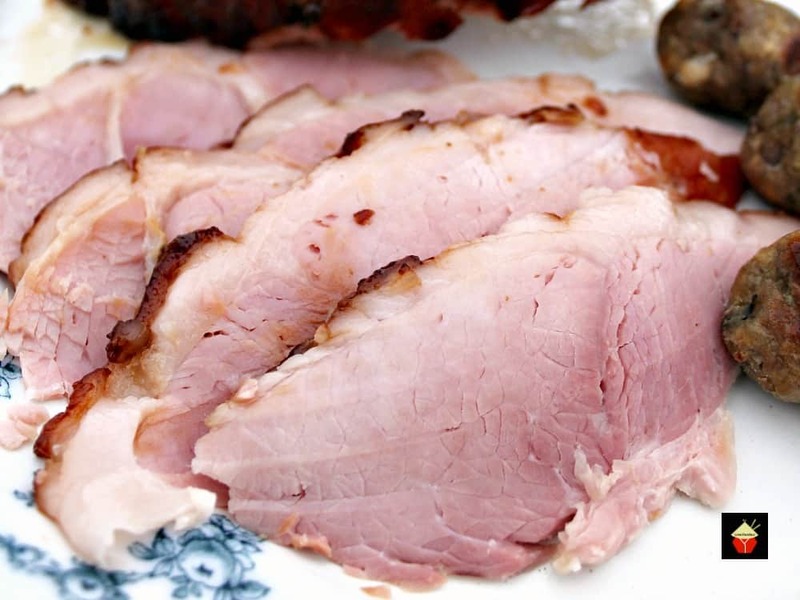 Have you ever eaten Ham that was dry or didn’t have much flavor? Maybe you cooked ham that took ages and ages to cook, or was just pretty boring to taste? 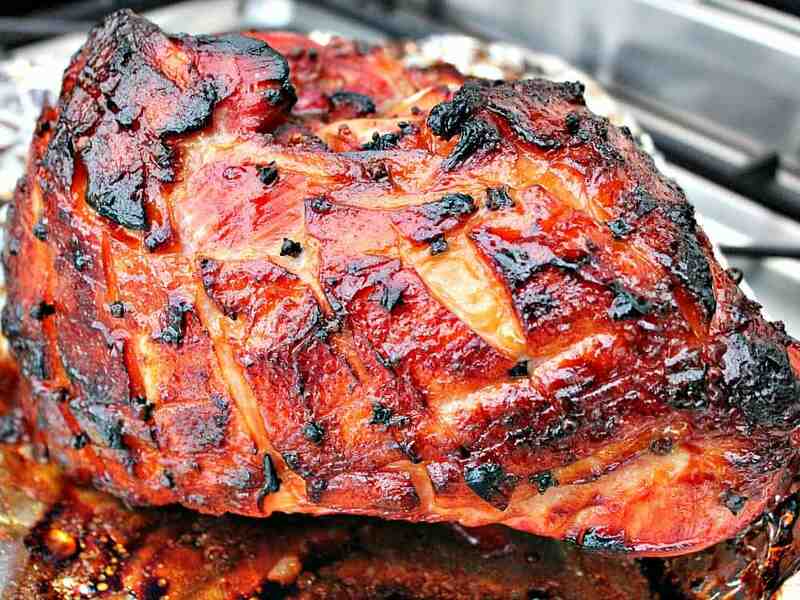 Well, this recipe for Honey Glazed Ham is going to be a keeper recipe for you! 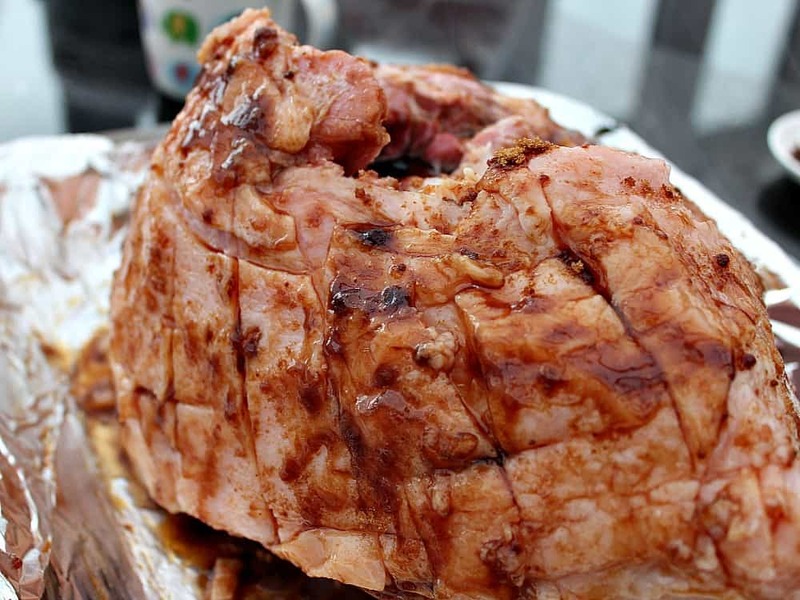 I often make this ham, and for Christmas and Easter time, when the shops are selling nice big joints of ham, I will buy one, with the bone in, and make Honey Glazed Ham. It’s so delicious! 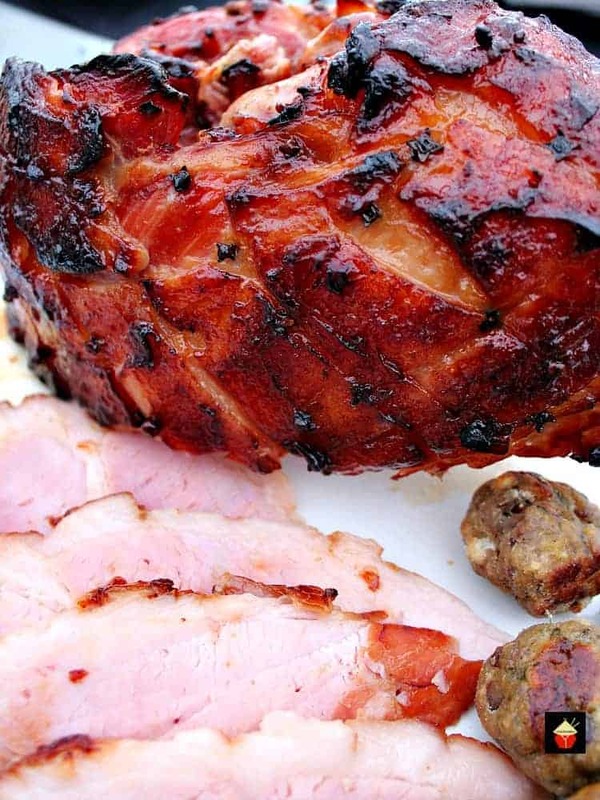 The method of cooking is perfect for keeping the ham moist and juicy with bags of flavor. 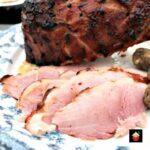 When the ham is first boiled, it will absorb all the flavors you add to the water, and then for the glaze at the end, the addition of honey and brown sugar is really quite something! 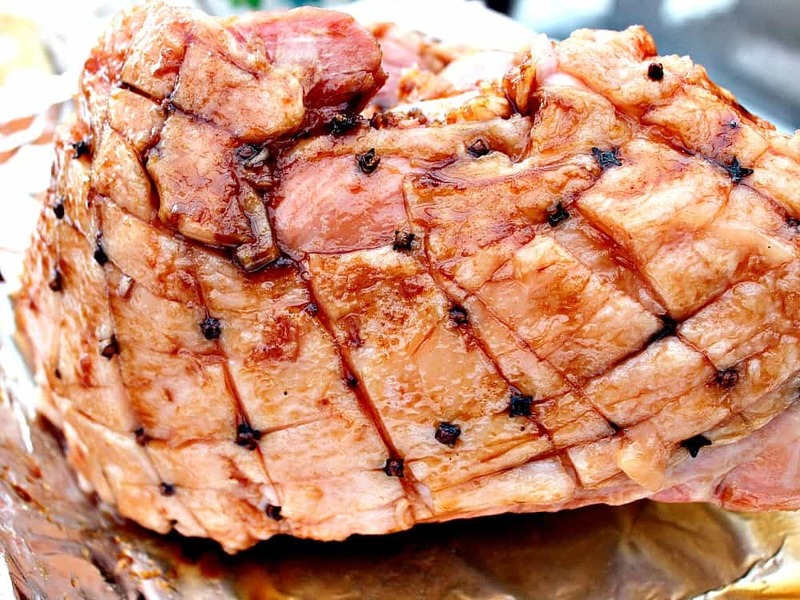 The cloves which are studded all over the ham give a gentle hint of spice and it certainly looks a picture when you present the ham ready for carving! The ingredients I list below to add to the water doesn’t need to be followed exactly. Sometimes I go through my vegetable drawer and simply pull out whatever I have and throw that in. 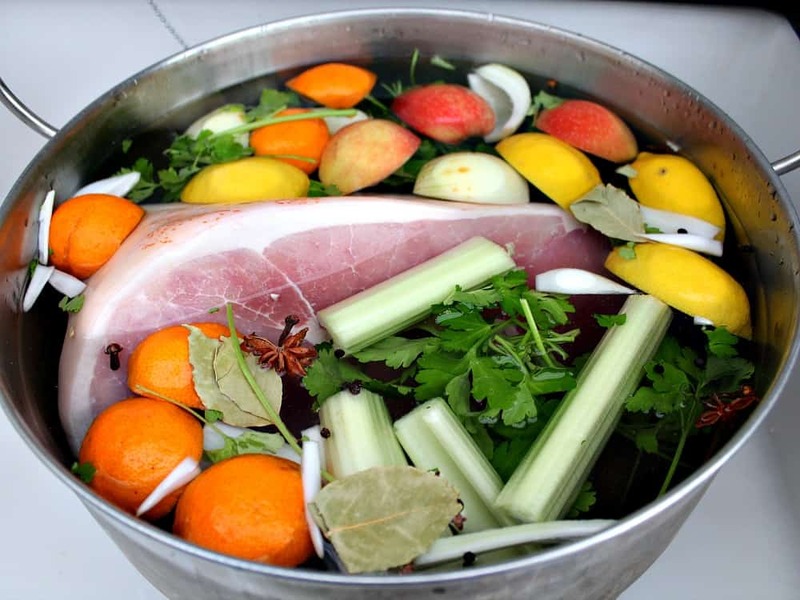 think of it as a stock which will be absorbed into the meat whilst it is boiling. The lovely thing about this honey glazed ham recipe is that you can save the stock and freeze it in a few containers. 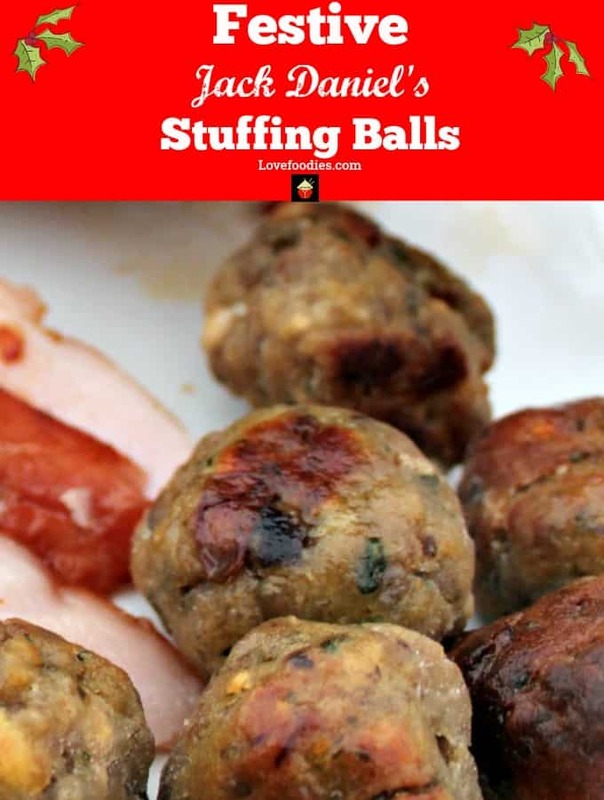 Use it in soups, casseroles, a crockpot dinner recipe and so on. 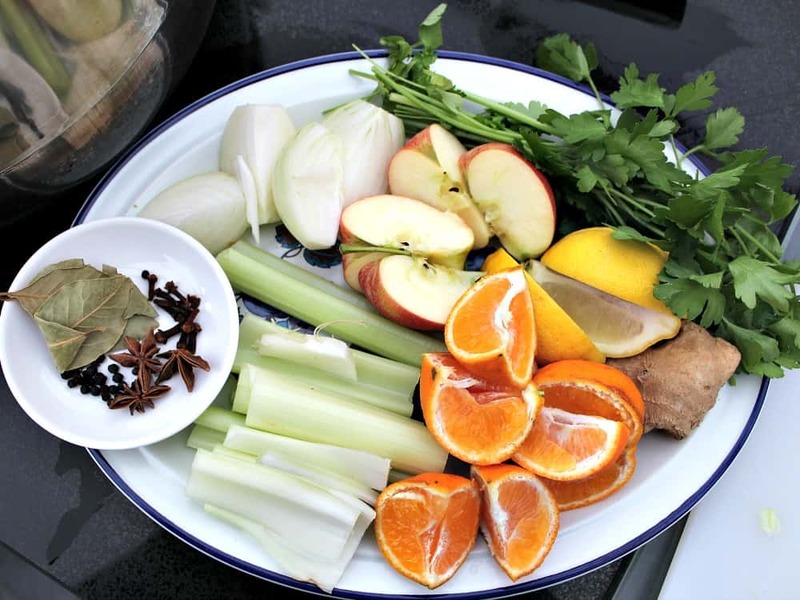 After all, why throw out some good tasting homemade stock?! The recipe itself is simple enough. Just make sure you have a pot large enough to fit your ham and the stock. 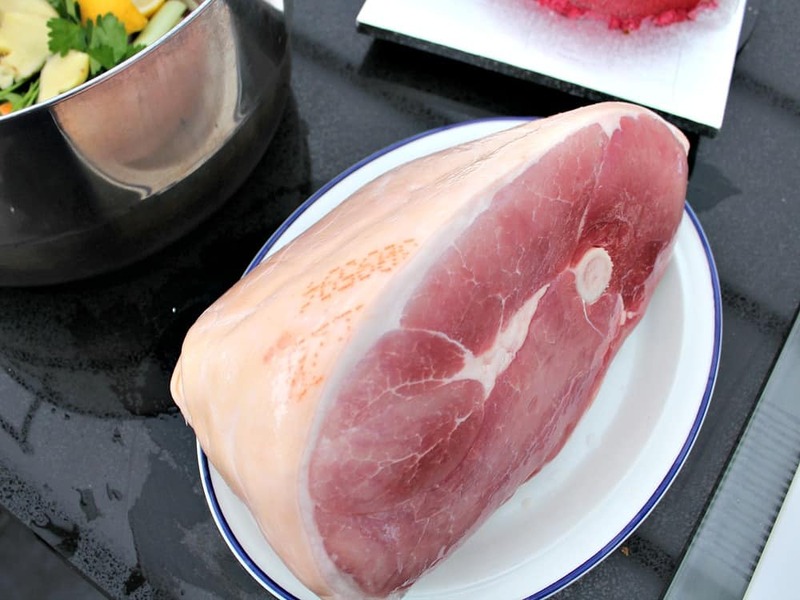 The honey glazed ham, once cooked will last wrapped and refrigerated for around a week, and if you have lots left over, why not slice some or cube some up (to add in a future chicken and ham pie!) and freeze in portions. 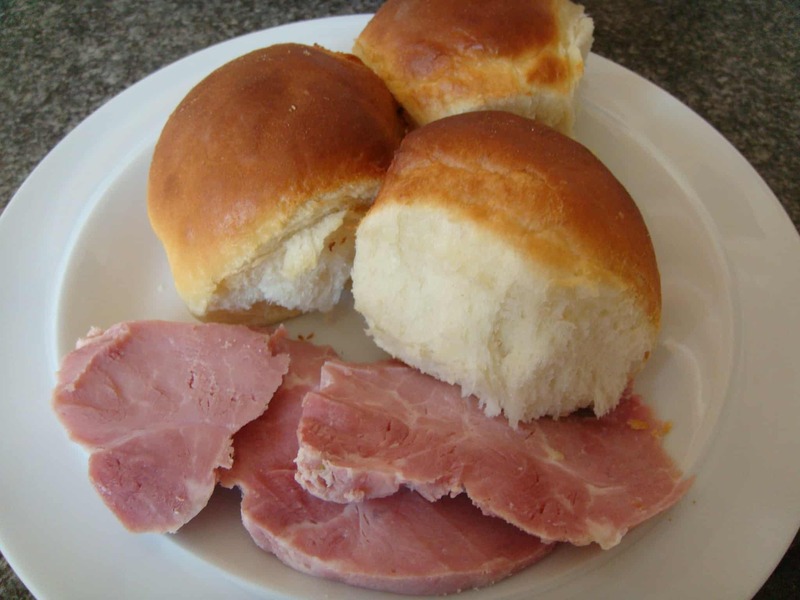 There are lots you can do with leftover ham, add to a lovely Macaroni Ham Salad, make sandwiches, cold cuts with pickles and chutneys, or serve a few slices up with our delicious Aloha Bread! So let’s get straight to the recipe and see how we make our Honey Glazed Ham! 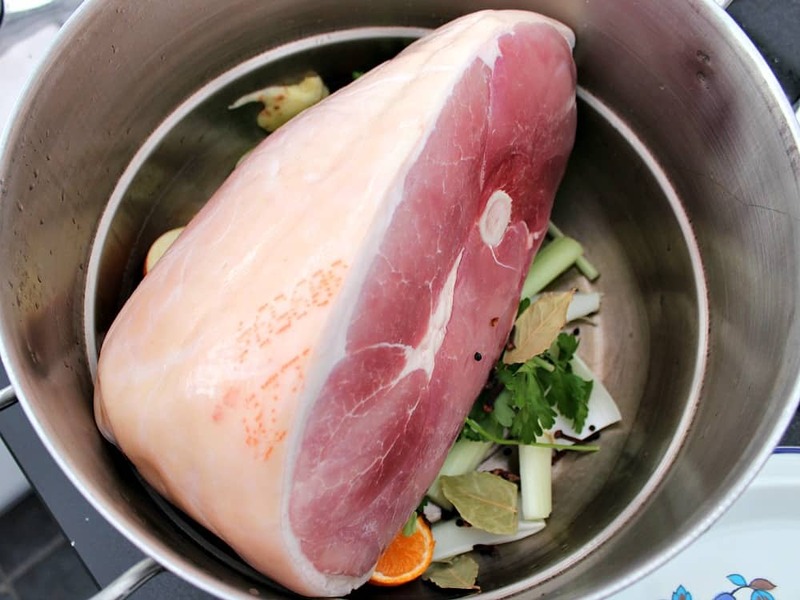 For Bone IN ham, allow 20 minutes per lb / 500 g.
Remove ham from packaging and rinse. Set aside. 3. Put all the ingredients into the pan. If you have ham with skin on, leave it on and place the whole joint in the pan. 4. Add cold water to the pan so it comes up 1 inch above the ham. 6. When the cook time is up, remove the ham from the pan and place in a well lined baking pan. Leave the ham to sit for about 30 minutes. 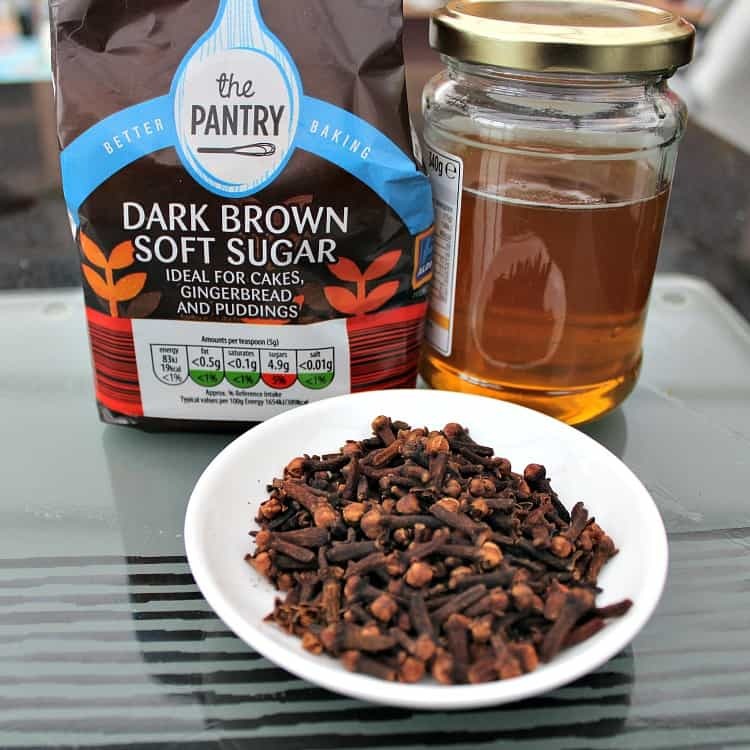 (It will be too hot for you to handle for the next step) Whilst you’re waiting for the ham to cool a little, get the cloves, sugar and honey ready because your hands will get a bit sticky when you do the next step. ** I double line my pan with heavy duty foil as the honey etc will be very sticky! 7. 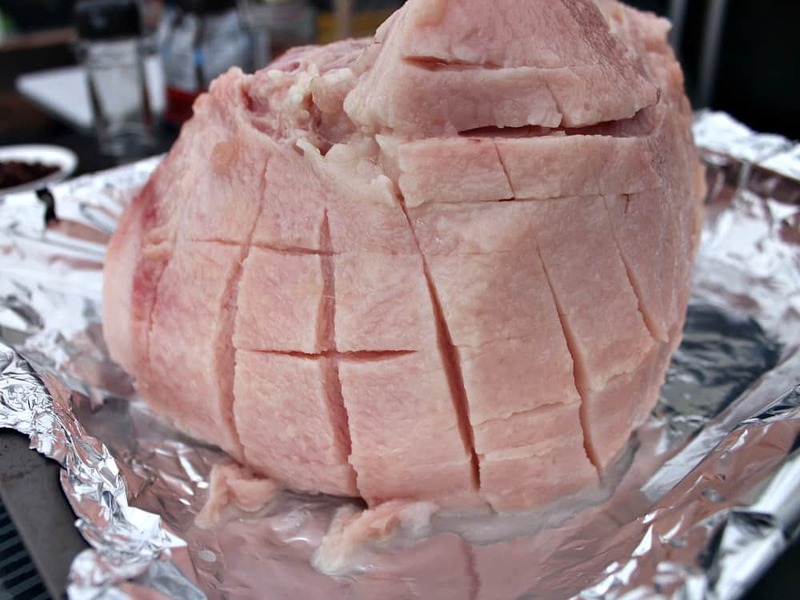 If your ham has skin on, use a sharp knife and remove the skin, but leave the fat underneath on, so your joint of meat will look like the one in my photo. 8. Now cut diagonal lines across the ham, cut down as far as the fat but not into the meat itself. Then cut lines the other way so you end up with criss cross lines like the picture below. 9. Rub the brown sugar gently over the fat, poke it into some of the lines you cut. I use my hands simply because it’s easier! 10. Then pour enough honey, and using a brush or your hand, cover the meat. 11. Now wash your hands! For the cloves, push a clove into each cut in the ham where your criss-cross cuts meet. (see my photo below). I find it easiest to pour some of the cloves into a bowl and use them from there as your hands will get a little sticky. 12. Take some pieces of foil and cover any parts of the ham which are not covered by fat. For my piece in the picture, the ends did not have any fat so I covered those to stop the ends from burning or going hard in the oven. Leave to cool or allow to rest for 20 minutes before removing from the pan and carving. This ham is delicious served either warm or cold, and be sure to save enough slices for yourself as this always is the first to all get eaten at parties!! 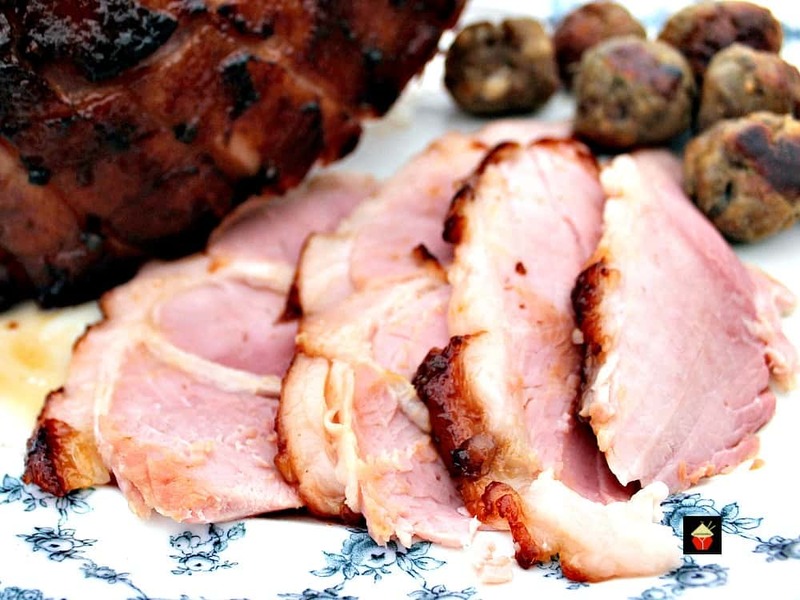 I served this Honey Glazed Ham at a party and popped some of our Festive Jack Daniel’s Stuffing Balls on the plate so everyone could help themselves! 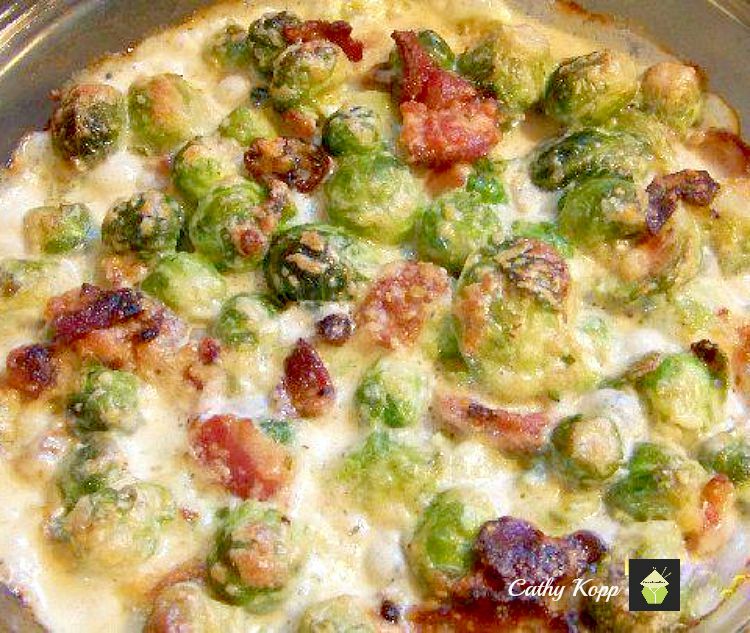 Bacon And Brussels Sprouts Gratin Add some pieces of honey glazed ham to this Bacon and Brussels Sprouts recipe. So good! 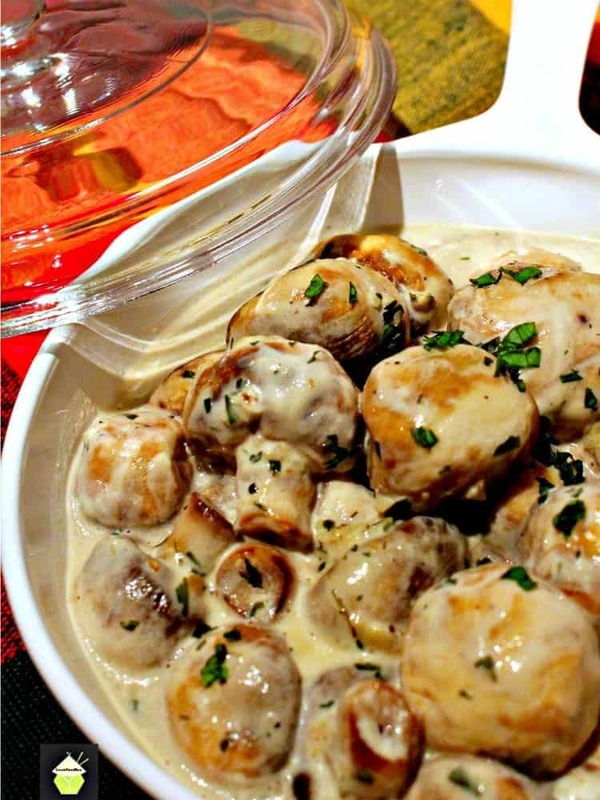 Creamy Garlic Mushrooms Add some chopped ham with these lovely mushrooms and mix with some cooked pasta and it’s a whole new meal! 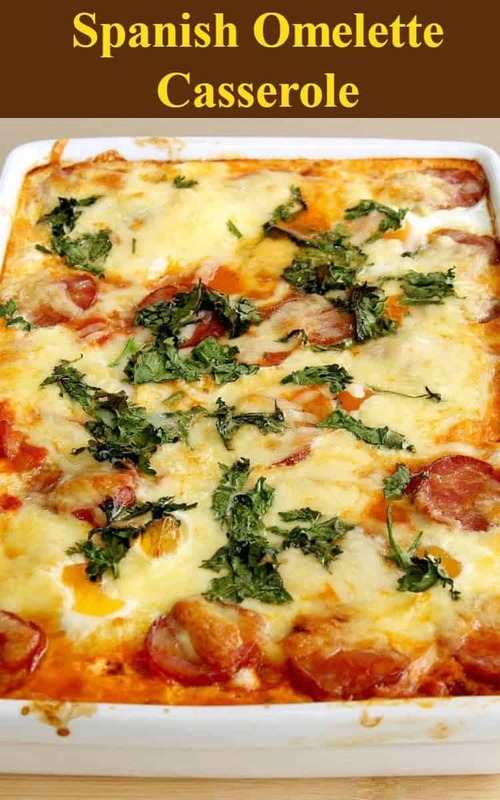 Spanish Omelette Casserole – This is great for using leftovers and I’ve also added some of our Honey Glazed Ham in it. So delicious! Put all the ingredients into the pan. If you have ham with skin on, leave it on and place the whole joint in the pan. Add cold water to the pan so it comes up 1 inch above the ham. When the cook time is up, remove the ham from the pan and place in a well lined baking pan. Leave the ham to sit for about 30 minutes. (It will be too hot for you to handle for the next step) Whilst you're waiting for the ham to cool a little, get the cloves, sugar and honey ready because your hands will get a bit sticky when you do the next step. If your ham has skin on, use a sharp knife and remove the skin, but leave the fat underneath on, so your joint of meat will look like the one in my photo. Now cut diagonal lines across the ham, cut down as far as the fat but not into the meat itself. Then cut lines the other way so you end up with criss cross lines like the picture below. Rub the brown sugar gently over the fat, poke it into some of the lines you cut. I use my hands simply because it's easier! 11. Now wash your hands! For the cloves, push a clove into each cut in the ham where your criss cross cuts meet. (see my photo below). I find it easiest to pour some of the cloves into a bowl and use them from there as your hands will get a little sticky. I was always told that something with the bone in is cooked longer, not the other way around.